The merger of two neutron stars creates a black hole in a new computer simulation from NASA. An amazing new NASA video shows two super-dense neutron stars tearing each other apart in a cataclysmic cosmic merger that ultimately forms a black hole. The neutron star collision video, which was produced by scientists at NASA's Goddard Space Flight Center, is a supercomputer simulation. It starts off with two neutron stars — the city-size, dense remnants of a violent supernova explosion — separated by about 11 miles (18 kilometers), NASA officials said. One object contains about 1.7 times the mass of our sun, while the other weighs in at 1.4 solar masses. "At 13 milliseconds, the more massive star has accumulated too much mass to support it against gravity and collapses, and a new black hole is born," NASA officials said in a statement. "The black hole's event horizon — its point of no return — is shown by the gray sphere. 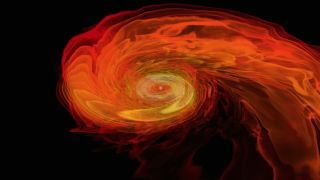 While most of the matter from both neutron stars will fall into the black hole, some of the less-dense, faster-moving matter manages to orbit around it, quickly forming a large and rapidly rotating torus." Neutron stars form when a star that is eight to 30 times the mass of the sun explodes as a supernova, leaving behind the compressed, dense core. One cubic centimeter (0.06 cubic inches) of neutron star matter outweighs Mount Everest, NASA officials said. In 2013, scientists found that mergers of neutron stars could create the gold in the universe. A group of astronomers, led by Edo Berger of the Harvard-Smithsonian Center for Astrophysics, discovered that the collisions of neutron stars could eject as much as 10 moon masses' worth of gold. Two neutron stars collide in a new video produced by NASA. Scientists think that the violent cosmic mergers of neutron stars can also produce short gamma-ray bursts, which last about two seconds and unleash as much energy as all the stars in the Milky Way produce in more than a year, according to NASA. The afterglow from these extremely bright explosions fades quickly, making them difficult to study. Astronomers want to be able to understand gamma-ray bursts by using large instruments on the ground to see the afterglow as soon as possible after the burst. Scientists also use the accurate positions and quick notification from NASA's Swift satellite, which can spot bursts from space.